My friend Sarah was just telling me that she recently went out with her mom and had Prosecco. Her mom called later asking what kind of Champagne they had, and she told her it was Prosecco. “No, it was Champagne, it had bubbles,” her mom said. I love hearing stories like this because it reminds me how confusing all this bubbly stuff can be for people. Prosecco is sparkling wine from the Veneto region. It’s made with the Glera grape (which until recently used to be called Prosecco, hence the name of the wine). It’s made in the Charmat method, which means its second fermentation is in a large stainless steel tank as opposed to in the bottle which is the traditional/Champagne method. Its flavor is a bit more peachy (though not sweet, that’s just the flavor profile) and the bubbles tend to be a bit bigger. I find it super drinkable, and because the regular ones are usually under 20 bucks it’s a fun, easy, and cheaper way to have bubbles in your life. 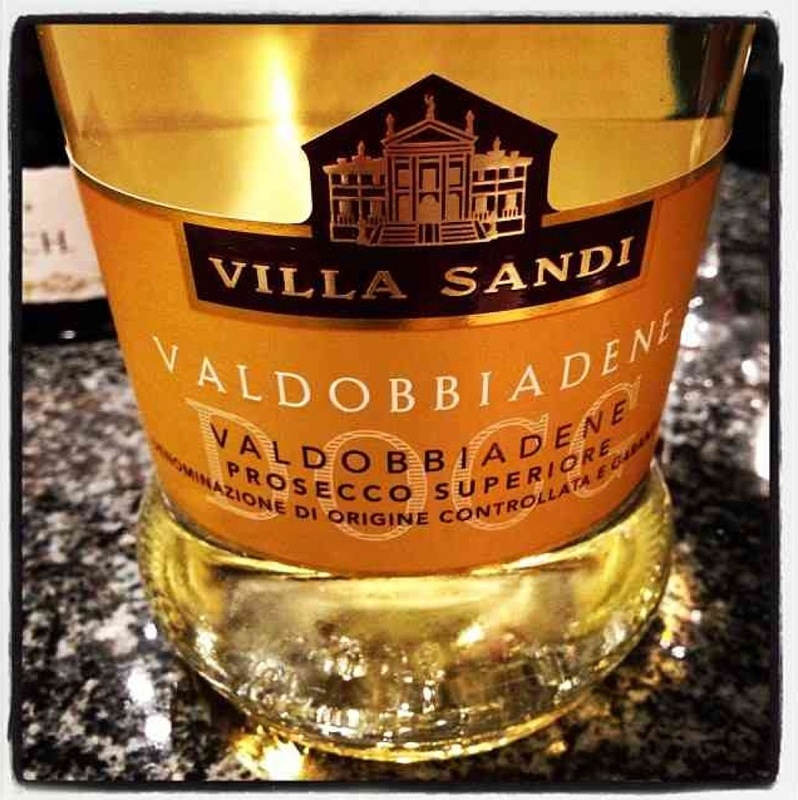 Villa Sandi makes a few Prosecco’s, loved this Superiore DOCG one. DOCG means that there are more regulations around the winemaking process, as opposed to DOC. It can indicate a higher quality wine, but sometimes it just means they adhered to the more detailed rules. Anyway, this Prosecco is lovely and only $18. Totally want to go to Italy now more than ever. Click on Fizzmas to see all the fizz and fun in these 12 days! And let me know what your favorite bubbly is below. Tags: fizzmas, glera, italy, Prosecco, wine. Bookmark the permalink. My mom was asking me about Prosecco today. It seems to be growing in popularity. Especially among moms haha! Cheers. The perfect Christmas drink. Prosecco has all the fun and bubbles and a light crisp flavor. Not too dry. Prosecco is just sweet enough to make every smile!